Welcome to Il Giardino Cafe! Il Giardino is the place to be seen & entertain your little VIPs of all ages! 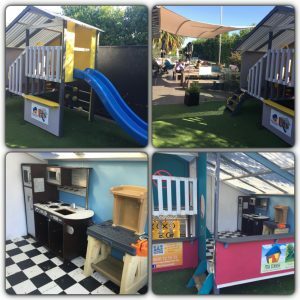 They have a large outdoor play area with 2 large custom-made cubby houses & that are positioned on fluffy fake grass, so it is suitable all year round & will keep your children entertained for hours, while you can relax with friends & family. Il Giardino Cafe is settled amongst the serene grounds of Gills Nursery with a stunning outlook to their display pool and kids play area, creating a light-filled and relaxed ambiance.